In 1960, a Norweigian husband and wife team came to the northeastern tip of Newfoundland in search of a Viking settlement. 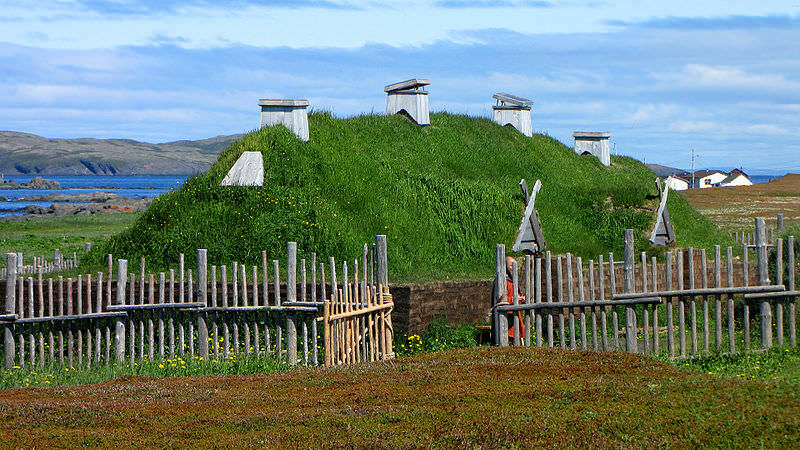 With the help of local residents they began to excavate a site at L’anse aux Meadows, and soon discovered the remains of several Norse buildings. After more years of archaeological work, the site became a UNESCO World Heritage site as the only authentic Norse site in North America. The digs revealed the existence of eight Norse buildings arranged in three complexes. The buildings were wooden frameworks overlain with sod walls and roofs. Fireplaces were located in the centre of each house. Among the important artifacts discovered were a small stone oil lamp, a small spindle whorl, a bone needle, a small brass ring, and bronze, ring-headed cloak pin used by Norse men and women of the eleventh century. This last piece of evidence was conclusive proof that Norse people inhabited North America 500 years before Columbus. Later digs turned up pieces of wood that could only have come from Europe, nails or rivets of the type found in Viking ships, and slag from the smelting and refining of bog ore – a process which marked the introduction of the iron age to North America. L’Anse aux Meadows has been a National Historic Site since 1977. Parks Canada operates a Visitor Centre which displays artifacts discovered during the archeological excavations. The park’s staff, dressed in period costume, offer interpretive tours of the archeological site and the adjacent full-scale replica houses. They provide visitors with a feeling of what it might have been like to live during the exciting era of Norse exploration of the North Atlantic. Visitors can hike the site using a series of board walks and short hiking trails and see the surrounding landscape which hasn’t changed much since the Viking era.